The first book I'd like to suggest you check out is simply hilarious! Be warned, the end of the story may cause you to laugh out loud for several minutes. A surprising and delightfully funny ending that many children may be very familiar with. 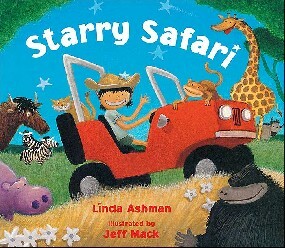 Starry Safari is the story of a little boy who, in his bright red jeep, bravely encounters many wild animals while on safari. In the end, he runs into the 'King of the Jungle' and.......this is the ending that I will not spoil for you but will let you discover for yourself insha'Allaah *smile*. You can also download a Starry Safari matching game here, a Starry Safari circle game here, and a Starry Safari crossword puzzle here insha'Allaah. 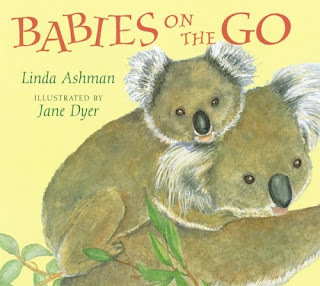 Babies on the Go is a wonderful story for babies and toddlers. From the day they are born, babies, human and animal, are transported by their mothers (and fathers) in various ways. This story explores the ways human babies and animal babies get from place to place in an endearing manner. The illustrations are delightful and their gentleness matches the story very well. But you're local library is a great place to start enjoying these two fun and delightful books. So, the next time you're at the library, check the shelves for Starry Safari and Babies on the Go and Check Them Out insha'Allaah! Did you enter the Smart Ark Giveaway? If not, click here to enter insha'Allaah! Starry Safari is suitable for ages 2-5 and Babies On The Go is suitable for children birth to 5 years old...waallaahu a'lam. I hope your daughter enjoys them and Insha'Allaah, your local library has them available. InshAllah! Will go take a look this weekend to see if they have them.